While taking notes for my review of Dell’s latest business notebook, I repeatedly found myself saying “Well, on the other hand…” The Latitude E7440 is bulky for a 14-inch Ultrabook— it’s almost a pound heavier than Lenovo’s X1 Carbon Touch. On the other hand, it’s super tough. You could drop it on the sidewalk and it’d still deliver the sales projections for tomorrow’s meeting. It’s outfitted with both HDMI and DisplayPort. On the other hand, you’ll need to carry a VGA adapter to connect it to the old video projector in the boardroom. Its battery croaks after just 4.5 hours. On the other hand, it’s removable, so you can swap in a spare. One thing my two hands and I agree on: We love using the Latitude E7440. It’s comfortable to work on in and out of my home office. The 14-inch IPS touchscreen is crisp and very bright, yet it’s remarkably resistant to glare and fingerprints, and responds beautifully to my touch. My fingers fly around on its large keyboard like they were made for each other, and the trackpad works great when I need it and stays out of the way when I don’t (read: no AWOL cursors). The keyboard deck has just the right slightly rubbery feel that lets my palms rest comfortably on it for long stretches. Dell's Latitude E7440 has a great keyboard and trackpad. On the other hand, its $1949 price tag sticks in my craw. And I’m sure it will stick in yours, too, whether you’re a consumer, small business owner, or an IT buyer for a large enterprise. On the other hand, quality-made tools are expensive. Let’s see what the Latitude E7440’s price-to-performance ratio looks like. The E7440 manages to be both pretty and rugged, its shell formed by the tough metal and carbon-composite material quickly gaining favor with higher-end PC makers. When I gripped the E7440 by the two ends and tried to twist it, it didn’t give one iota. Even the screen panel, a mere quarter-inch thick, barely flexed when I whipped the lid up by just its corner and snapped it shut again. The E7440's shell is fabricated from aluminum and carbon fiber. Dell says the machine has passed no fewer than 18 MIL-STD-810G tests, including being subjected to extreme heat and cold, high humidity, vibration, drops onto a hard surface, blowing sand and dust, and liquid spills on the keyboard. The Latitude E7440 has a gorgeous, non-glare, 14-inch IPS touchscreen with native resolution of 1920x1080 pixels and the best off-axis viewing I’ve seen so far. The keyboard flexes in its middle and its keys bounce a little much, but they don’t clatter and they render nearly every keystroke correctly. The slightly concave keys are nicely islanded from each other, and offer just the right level of friction. Four levels of backlighting are available, which makes the computer easier to use and reduces the load on the battery when you don’t need its brightest settings. The Dell's 1920x1080-pixel touchscreen looks great, but Lenovo's pricey X1 Carbon Touch is available with a 2560x1440-pixel touchscreen. The E7440 has two pointing devices: The rubber-tipped pointed nub nestled in the middle of the keyboard that ThinkPads are famous for, and a multi-touch trackpad with two mouse buttons. I’ve never been wild about a pointing stick—it’s like trying to drive a sports car using a tiny steering wheel. Those who master it love the ability to keep both hands over the keyboard’s home row. Me, I still like a trackpad, and the one you get on the E7440 is great. It handles multitouch gestures such as pinch-to-zoom with nearly perfect sensitivity, and it provides terrific palm rejection. My only beef: The trackpad can make the pointer a little grabby, occasionally snagging icons and things as I moved the pointer across the screen. Too many Ultrabook designers drop important ports in pursuit of ever-thinner profiles. The E7440 offers nearly everything you could ask for in a laptop this size, including hardwired Ethernet, HDMI, mini DisplayPort, an SD card reader, and three USB 3.0 ports. Dell's business-oriented Ultrabook is a little thick in the middle. Many of these ports are located on the notebook’s rear deck, which makes them a bit of a hassle to access. Dell outfits the E7440 with an 802.11ac Wi-Fi adapter. But if you find yourself frequently deskbound, Dell includes a docking station port on the bottom of the computer. A combination VESA monitor stand and docking station is available for $225. You can further beef up the notebook’s enterprise chops with a mobile broadband adapter, a Smart card slot, and a fingerprint scanner. Powered by an Intel Core i5-4300U processor, 4GB of DDR3L/1600 memory, and a 256GB SSD, the Latitude E7440 ran smoothly and cranked through basic tasks just fine. Just don’t expect it to rip through intense computational tasks like video rendering or playing AAA games—it’s not designed for those workloads. Both machines have similar specs, but Lenovo's X1 Carbon Touch outran Dell's Latitude E7440 when it came to WorldBench. Still, its benchmark scores left me just a little disappointed. It finished well behind the aforementioned X1 Carbon Touch, which is powered by the same CPU; and a little behind HP’s EliteBook Folio 1040 G1 , which runs on Intel’s Core i5-4200U processor. The Latitude E7440 trailed on the PCMark 8: Work Test as well. When the Latitude E7440’s battery dies—our grueling battery-rundown test killed the one is this eval unit in just 4.5 hours—you can pull it out and slap in a fresh one. That’s a rare attribute of modern Ultrabooks, and it’s a good thing, because it took more than 4 hours to not-quite fully charge the original. Taking advantage of that feature means packing a second 10-ounce battery (or forgetting to pack, or packing it only to lose it in your travels). I’d much prefer to just have one battery that lasts a good, long time. Dell's Ultrabook fared a little better in terms of battery life, and you can remove and replace its battery if you don't mind carrying a spare. On the other hand, the battery in the X1 Carbon Touch’s pooped out in even less time, and it’s not swappable. But the X1 Carbon Touch’s battery charges faster, its 14-inch IPS screen delivers higher resolution (2560x1440 pixels), and it scored higher in our benchmarks. Both machines are built tough, but as I pointed out earlier, Lenovo’s is much lighter. On the final other hand is the X1 Carbon’s current price tag. The machine wasn’t even listed on Lenovo’s website when I wrote this review, and the third-party retailers that did have it on offer priced it considerably higher than what Lenovo quoted us when we reviewed it. Bottom line: If money were no barrier, I'd buy Lenovo's X1 Carbon Touch. But Dell's cheaper Latitude E7440 even though it weighs more. It's an exceptionally good business laptop. 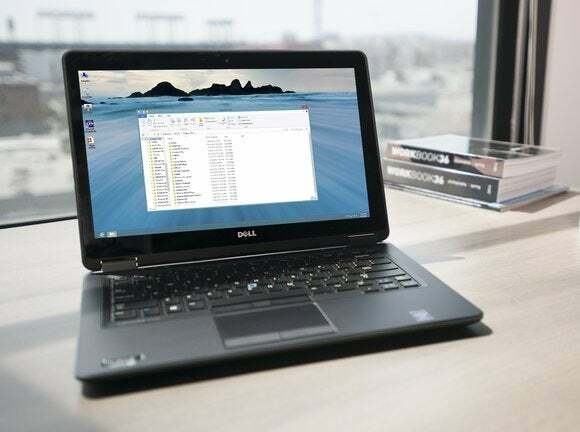 Dell's engineers have built a dream machine for business users on the go, although we have a few quibbles about weight and battery life.